Taking a trip this summer? Take better videos by following these 3 simple tips: 1. Hold your smart phone sideways – that’s how it will be viewed. 2. Hold your camera as still as possible – viewers don’t want to see wild, jerky movements as you try to capture every piece of the action. 3. Get someone to video you (or turn the camera on yourself) talking about what’s about to happen, where you are, or what just happened. If you don’t want to fuss with learning how to edit, send your videos to me, and I will create a beautiful little film for you, professionally edited with your choice of royalty-free music. Contact Personal Story Films at personalstoryfilms@gmail.com, call us at 617-942-1875. See the Gallery page for my Costa Rica video. I have just finished creating an eBook, entitled, 20 Ways of Preserving Memories of Parents and Other Loved Ones. There are countless ways to capture the memories of the people you love. I came up with and found a select twenty ideas that I categorized into Digital and Photographic, Writing and Books, and Arts and Crafts. If you would like to receive your free ebook, please email us at personalstoryfilms@gmail.com. Some examples of ideas are: recording you and your parent looking through old photo albums, making a collage with photos and special objects (right), and collecting quotes, notes and postcards from your loved one to make into a book. I hope you try some of these ideas out. If you find you would like help bringing any of these ideas to fruition, I will be glad to. I would also love to hear from you about your experiences with these ideas. Enjoy! Storytelling has been around since before humans were Homo sapiens. We tell stories to relate events and important news, to entertain, to keep our cultures and communities strong, and to make sense of our lives. Telling our stories has become more popular than ever as our culture embraces the personal story on talk shows and through biographies, autobiographies, and memoirs. It can give us a sense of connection that is missing, as the extended family living together becomes rare. As the pace of change has become dizzying, storytelling gives us a much-needed connection to our past. When you take the time to hear and preserving the stories of our parents and grandparents you will never regret the investment. Email us at personalstoryfilms@gmail.com to get started on your own family story project. Junius Stephenson slowly and carefully takes out the drafting instruments from the felt-lined box. He explains how each one was used in his work as an engineer designing solid waste disposal systems. Now, of course, everything is done more quickly on computers, but maybe we miss out on something real and tangible when we don’t have a felt-lined box of useful and well-cared-for tools. Sometimes the tools of one’s livelihood become a conduit for memories to tell the next generations what life used to be like. This awl, that protractor, this thimble. I have my grandmother’s silver crane-shaped sewing scissors. 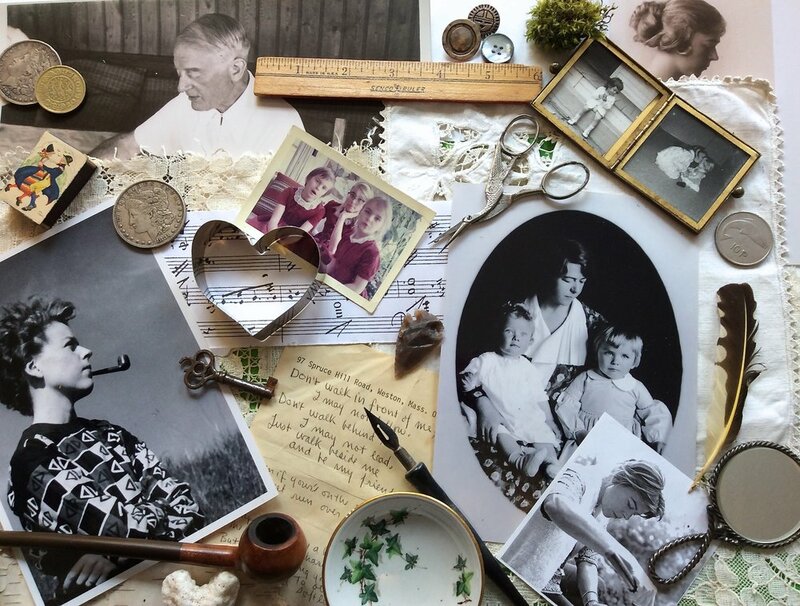 Are there objects from your parents’ or grandparents’ lives that have stories to tell? Who are the elders in our families and communities? Often, they are people who have paved the way for the things we take for granted now. The oldest have been through the depression, suffered though the holocaust, or fought in World War II. Some have broken through racial or gender barriers to take their place in a society that didn’t want them there, or protested discrimination so we can take it for granted that of course we can hold hands in public, get married, and keep our jobs when we come out. Our elders have lived through trials and losses, and have worked hard to raise their families and keep things together through hard times. The good ones have loved us unconditionally when we most needed that kind of love. My father and aunt were those kind of people for me. How can we repay those gifts? Bring them tea, make their lunch and dinner, do the tasks that they don’t want us to know they are too tired to do. Visit often, accept their advice, offer them a seat. And take the time to sit and listen to their stories. Ask them questions about their lives and listen without impatience as they tell the whole circle of the story. And if they are willing, record their stories to be shared with the next generations. My parents and aunt have passed away now, so I’ll need to find the elders in my community who I can honor and listen to. What a gift to myself! At Personal Story Films, we encourage elders to share their stories on camera. We make a unique, professional film about their lives, and their families receive a priceless treasure. What are the benefits to storytellers themselves? As many have learned, sharing life lessons and wisdom helps us feel a sense of purpose and meaning for the lives we have lived. According to an article in the New York Times, telling our stories helps us find a sense of identity. It also aids in grieving, encourages a positive take on life, and helps us forgive ourselves for our past mistakes. Sherry Hamby, writing in Psychology Today, said, “Research shows that even brief autobiographical storytelling exercises can have substantial impacts on psychological and physical health even months after the storytelling. People who have found their voice, shared their story, and reaffirmed their values often find a sense of peace and a hopefulness that they did not have before.” Telling your story is a positive and life-affirming choice for all concerned. What do you most want from your parents? Their money and property, or their stories, life lessons, and wisdom? 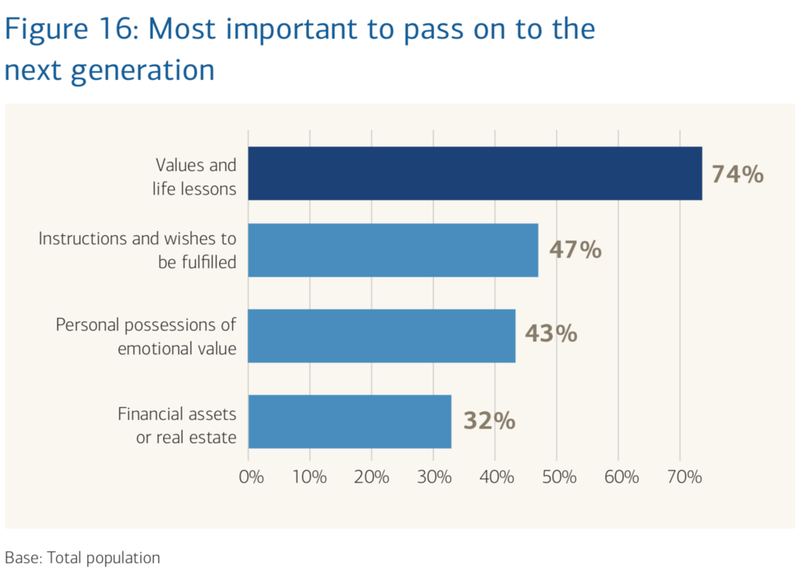 According to research, a large majority (74%) of people over 45 would rather inherit life lessons and values from their parents than money*. You probably also want their stories, and have a way to remember their personalities. A life story video or film is a good way to do that. *Americans Perspectives On New Retirement Realities And The Longevity Bonus, A 2013 Merrill Lynch retirement study, conducted in partnership with Age Wave.